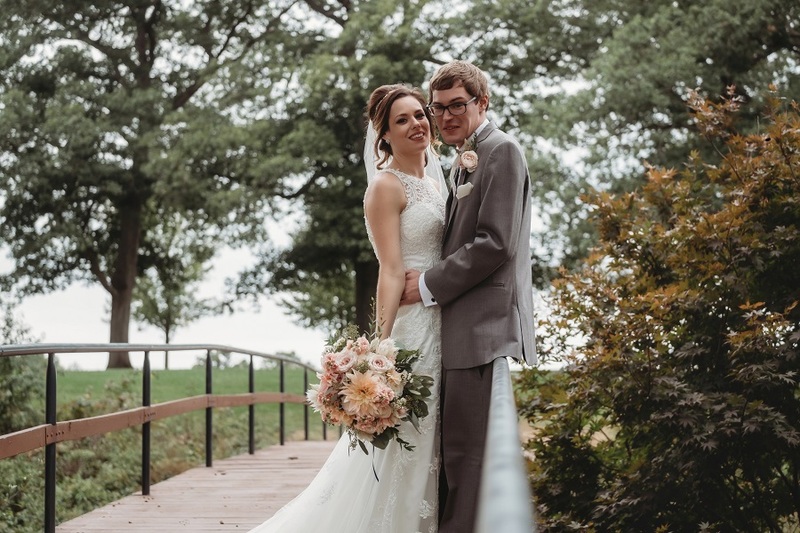 Cody and Megan were married the end of September at the charming Kickapoo Creek Winery located close to Peoria, Illinois. While in high school Cody was a good friend of Megan’s neighbor (Tyler) and because she was very close with Tyler and his family, his house was the hang-out spot and was actually where Cody and Megan first met. They dated four years while in high school and college, but because they were separated by college, the distance started to tear them apart and they eventually broke up and dated others. Their family still thought they would get back together but neither of them thought that would happen. On a frigid December day a year before they were engaged, they were at Navy Pier helping their best friend’s proposal happen. Cody told Megan, if I ever propose it will be in the summer when it’s not so cold. 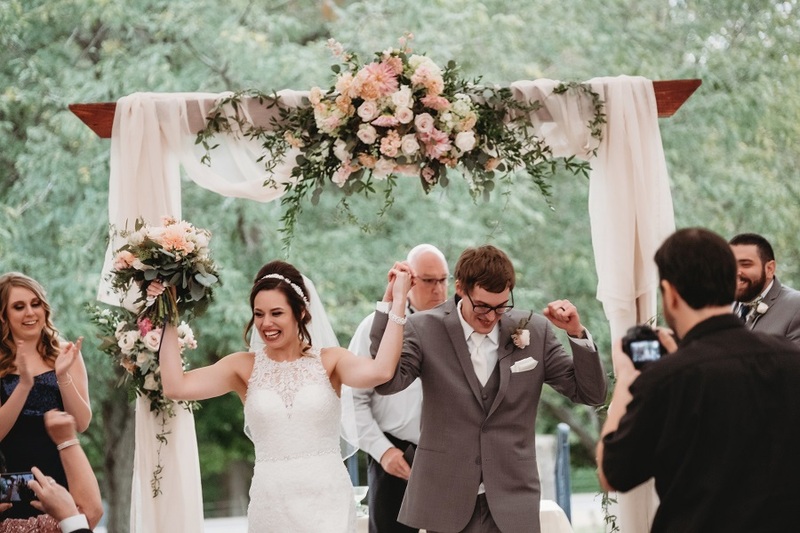 But a year later on a cold beautiful snowy day at Brookfield Zoo – Winter Light Festival, Cody asked for their photo to be taken in front of the big Christmas tree and after the photo, Megan turned and there was Cody down on one knee!!! 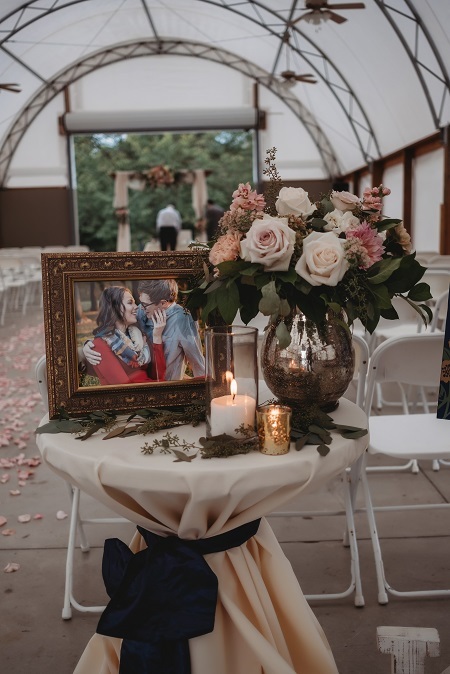 Megan wanted Cody to be a big part of the wedding planning but found that Cody didn’t like the same colors she had thought about for the wedding color palette. 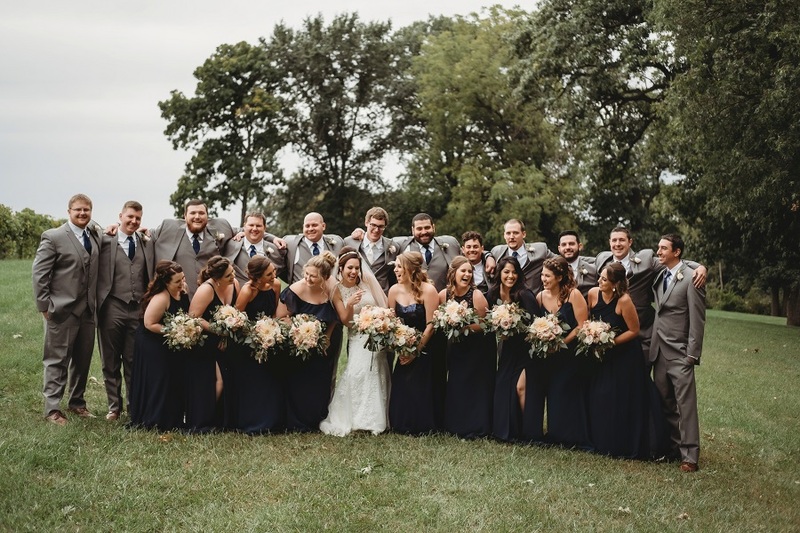 Cody came up with navy blue and Megan found that she really liked it paired with light gray tuxes and soft colors for the wedding flowers in peach, blush and light pink. 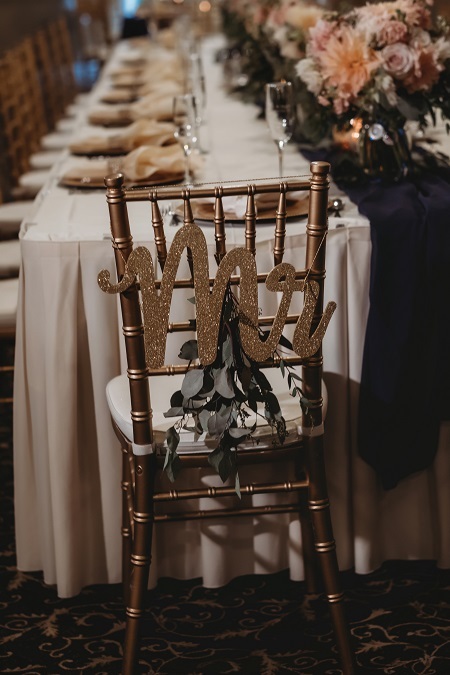 Megan knew she wanted some sparkle, and the theme really came together when they added the touches of gold. 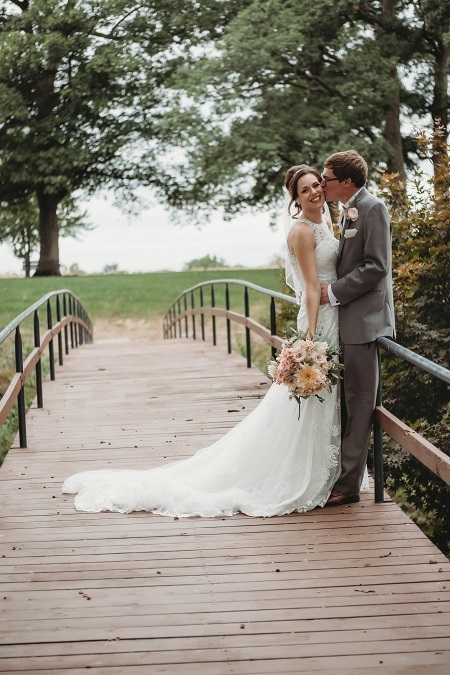 What Megan enjoyed most about wedding planning was including Cody in all the major decisions, and having almost a year to make the plans. 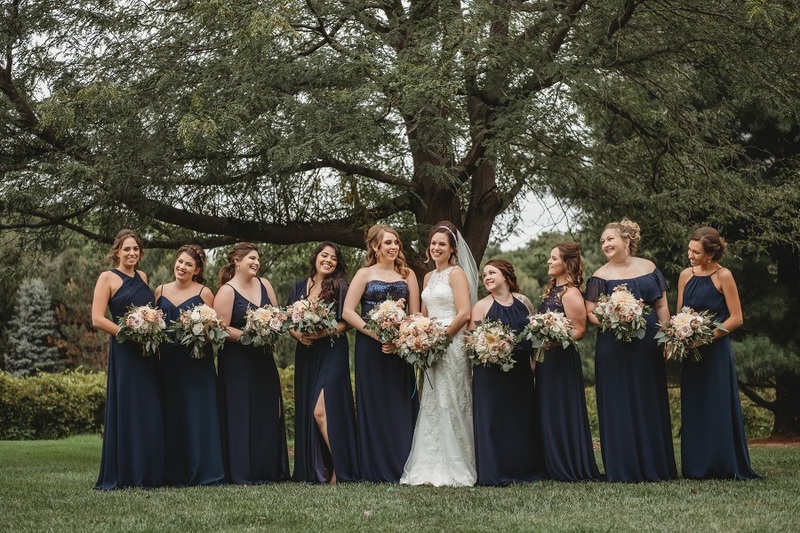 A lot of people told Megan that the bride usually makes the decisions, but she knew she wanted to make most of them together as a couple. Seeing Cody get so excited and having his support was her most favorite part. The guest list turned out to be the hardest part of wedding planning for them. It was difficult standing up to their parents and reminding them that it was their day!! Once everyone was on the same page, it became a lot easier. 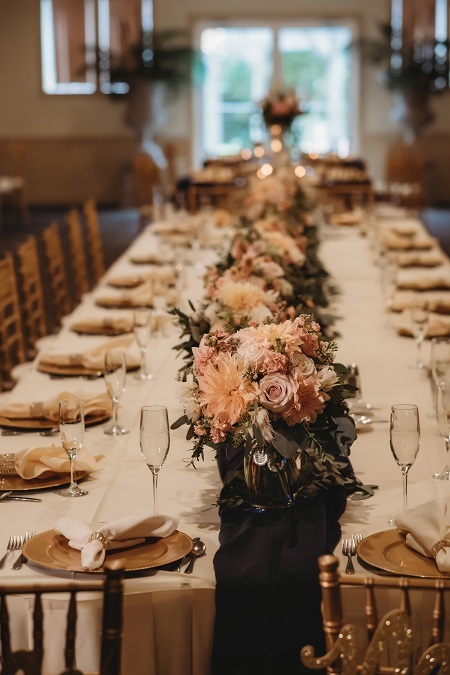 We have actually had many couples tell us this – that the guest list and working it out with their parents was the most difficult part of wedding planning. 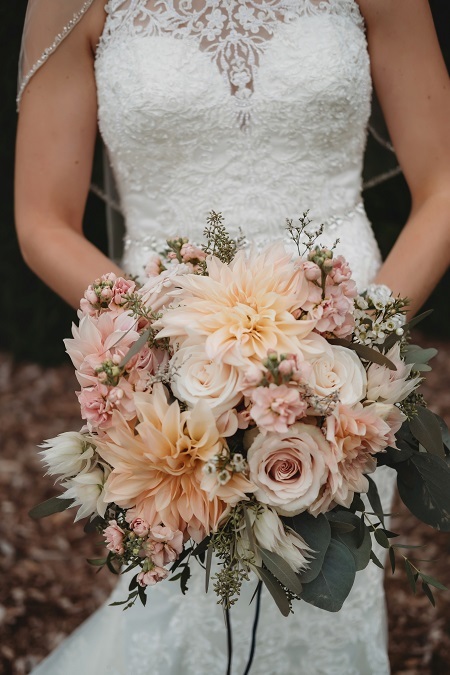 For her wedding bouquets Megan chose the beautiful Cafe Au Late dahlia, blush, peach and light pink roses, stock, wax flowers and blushing bride protea along with a mix of eucalyptus types. 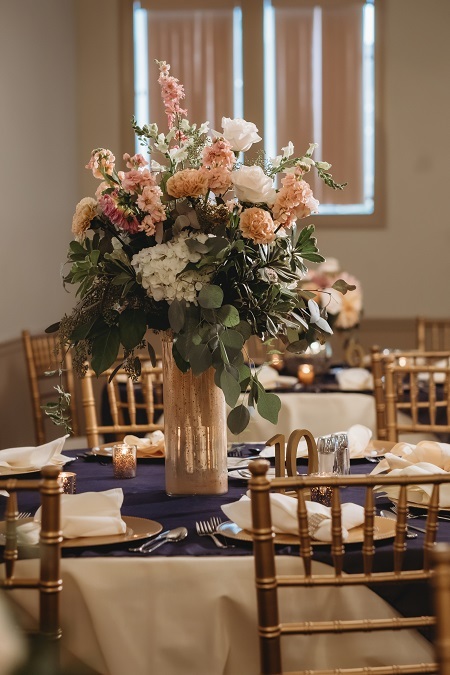 The table centerpiece arrangements and the wedding arbor backdrop were created with those same blooms also adding in some hydrangeas, larkspur, snapdragons and carnations with other assorted greens. 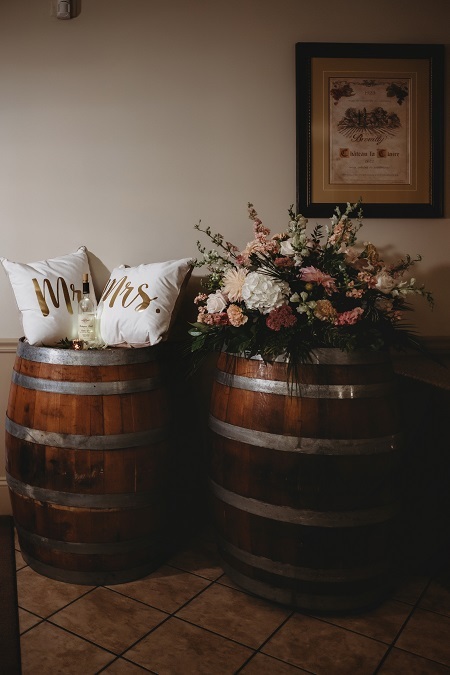 Denise Petersen, the day of coordinator/decorator supplied the gold vases, candles and other wedding decor and we created large and lush floral arrangements to decorate the wine barrels used to decorate at the winery. 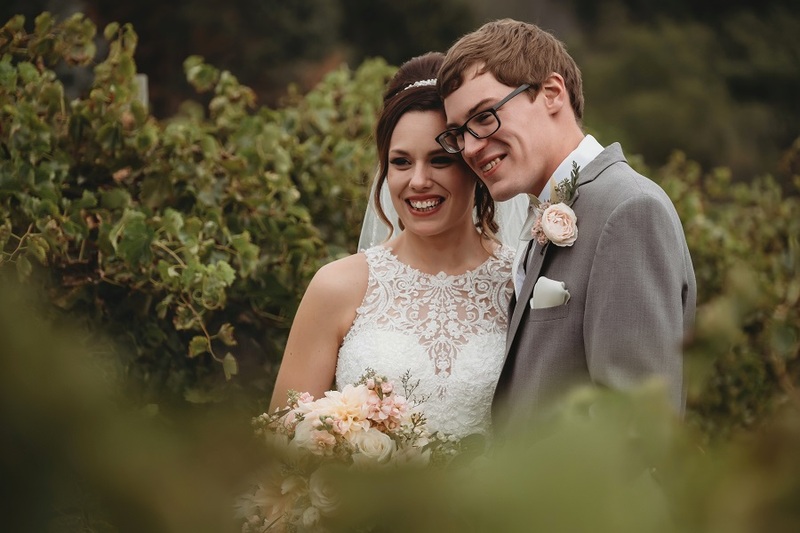 Megan’s favorite memory of her wedding day was their “first look.” She remembers standing at the end of the vineyard looking at Cody while he was turned around and just waiting to be able to start walking toward him and finally giving him a big hug. 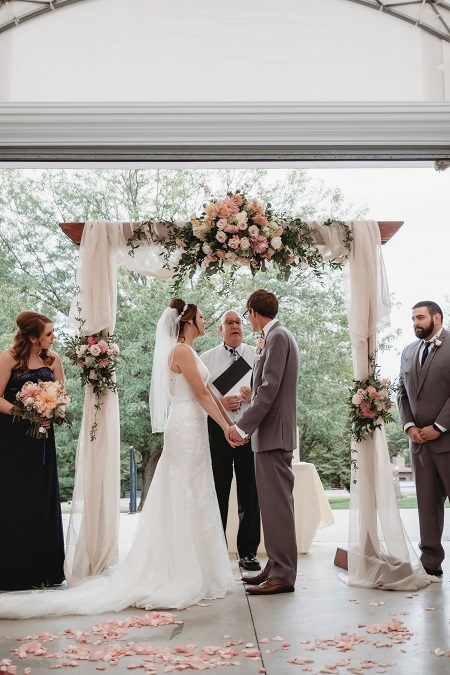 She also fondly remembers their first kiss when the officiant said, “you may kiss your bride.” She felt like there was nobody else in the room – just her and Cody!! 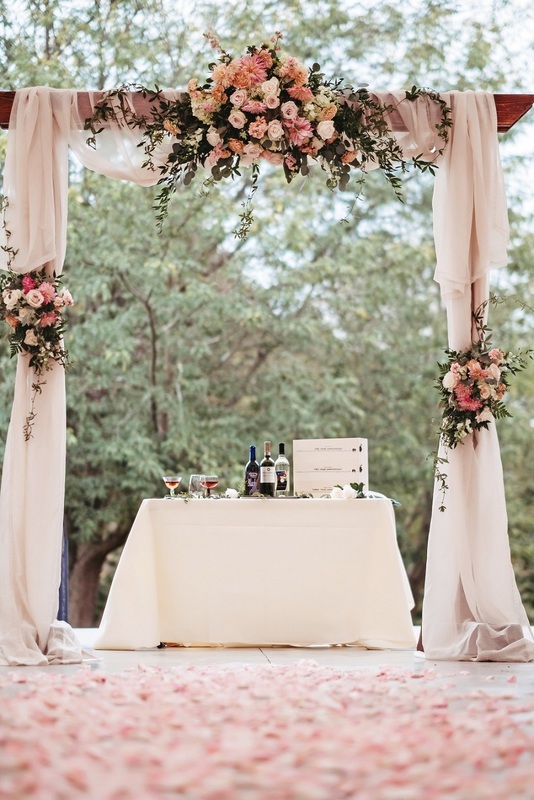 Wedding planning advice from Megan includes: “Never forget the reason why you are doing all the planning! There are times it definitely gets stressful, but try to keep in mind that everything will go by so fast; everyone told me that. During our engagement when I started to get overwhelmed with all the planning, Cody was the one I leaned on and that made it easier. On the actual day there are so many little things you won’t even be thinking about – you will be in the moment with your family and friends and that is when you get to enjoy every single moment. We were so thankful to have a day of coordinator/decorator so that we didn’t have to worry about a thing!